2/add a drizzle of sunflower oil into the saucepan and add the onion. Cook until soft and golden. 10/place 300g spaghetti into boiled saucepan of water and heat the spaghetti for around 10-15 minutes until cooked. 11/remove spaghetti from heat, drain and serve. 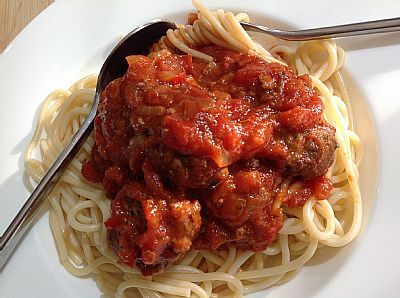 Top with meatballs and rich tomato sauce. Enjoy!! 4/place kale and leek in a glass bown, add cold water, cover with clingfilm and heat in microwave for 10 minutes. Remove and leave to stand once cooked. 6/place chopped potatoes in a glass bowl, cover with cold water and heat in a microwave for 15 minutes or until soft. 8/add 1 cup of cold water, stockcube to the saucepan and bring to the boil for a few minutes. 9/add 1 x tablespoon of cold water to the cornflour and add to saucepan, allow to thicken then heat for a further 5 minutes. 10/mash the potatoes then add the English mustard. Serve all ingredients. 1/place 1 x teaspoon of sunflower oil in a wok or shallow fry pan then add chopped onions and fry for a few minutes. 2/remove seeds from peppers and add chopped red, yellow, green pepper and continue to cook on medium heat. 3/dice chicken and add to onion and peppers and continue to cook on medium heat. 4/chop fresh coriander and stir into fish stock before adding to saucepan and cook on medium heat for around 10 minutes. 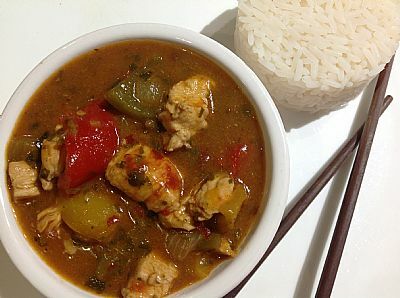 5/add reduced fat coconut milk to saucepan and continue to cook for around 15-20 minutes until stock has reduced and begins to thicken. 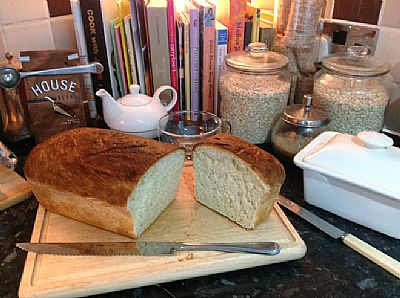 6/serve with cooked rice or wholemeal pitta bread. Enjoy!! Equipment required: medium sized fry pan/griddle, teaspoon, oven tray, foil, metal spatula, glass bowl, sharp knife, chopping board, wooden barbeque skewer. Ingredients: 1 x teaspoon lazy chilli, 2 small brown onions, 500g minced beef, vine tomato's iceburg lettuce, seeded brioche burger bun, sunflower oil. Method: peel and dice the onions into small chunks. Add 1 x tablespoon of sunflower oil into medium sized frypan then add diced onions. Fry gently on a medium heat until light golden brown. Place minced beef into a glass bowl and mash using hands. Remove onions from heat and add to mashed minced beef. Stir ingredients together then add 1 x teaspoon of lazy chilli. Divide mixture into 9 handful sixed rounds then press gently using a chopping board to make a circle shape. Add each small burger to the medium sized fry pan then cook on medium heat for around 5 minutes on each side or until deep brown in colour. 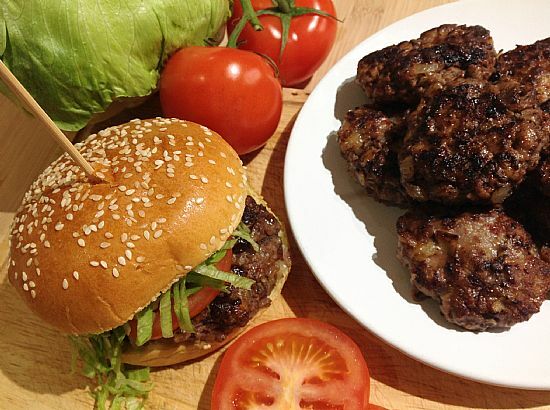 Once cooked on both sides, remove all small burgers and place in an oven tray and cover with foil. 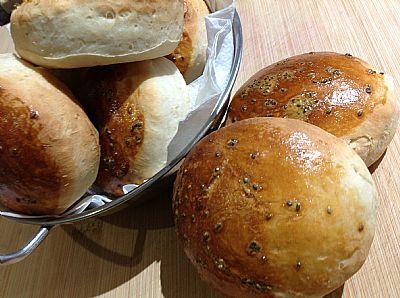 Place in a heated oven on gas mark 5/170 for around 15 minutes, this will allow the burgers to cook thoroughly and will also drain the oil from the burgers. Remove the burgers from the oven then leave to one side. Shred the required amount of iceburg lettuce, slice the vine tomatoes then add 2 x small burgers to a seeded brioche burger bun before topping with vine tomato and shredded lettuce. Place the barbeque skewer through the middle of the burger bun before serving. Enjoy! Storing: Suitable for freezing. Simply place into portion sized containers. Equipment required: wok or medium sized fry pan, large saucepan, colander, chopping board, sharp knife, teaspoon, tablespoon, serving ladels. 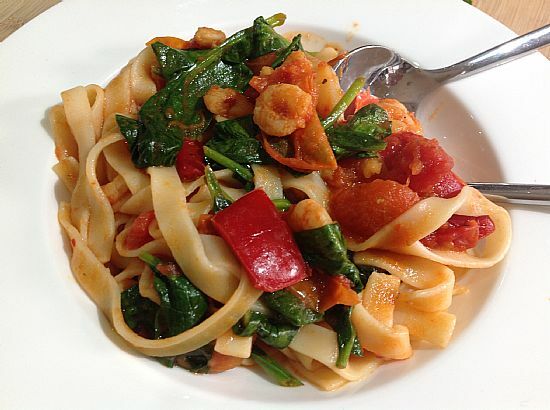 Ingredients: 2 x red peppers, 350g tagliatelle or 3/4 of a 500g bag, 350g cherry tomatoes or 4 handfuls, 4 handfuls of baby spinach leafs, 1 x teaspoon of chilli, 1 x tablespoon of sweet chilli sauce, 1 x tin of chopped tomatoes, 350g large prawns, sunflower oil. Method: Pour 2 pints of boiled kettle water into a large saucepan and add tagliatelle. Heat for around 10 minutes before removing from heat and leaving to cool. Chop red peppers in half and remove seeds and inner. Chop into small chunks. Pour 1 x tablespoon of sunflower oil into wok or fry pan and heat on medium heat. Add chopped red peppers and heat for a few minutes. Chop cherry tomatoes in half and add these to wok/fry pan along with red peppers. Heat for a few minutes on high heat before adding prawns and continue to heat on medium/high heat to allow liquid to reduce. Add 1 teaspoon of chilli and 1 tablespoon of sweet chilli sauce to the wok/saucepan. Stir all ingredients together and continue to heat for around 5 minutes before adding tin of chopped tomatoes. add 4 handfuls of baby spinach leafs to ingredients and gently stir in. Drain the cooked tagiatelle and place all ingredients into a large saucepan. Stir all ingredients gently before serving. Enjoy! Storing: suitable for freezing. 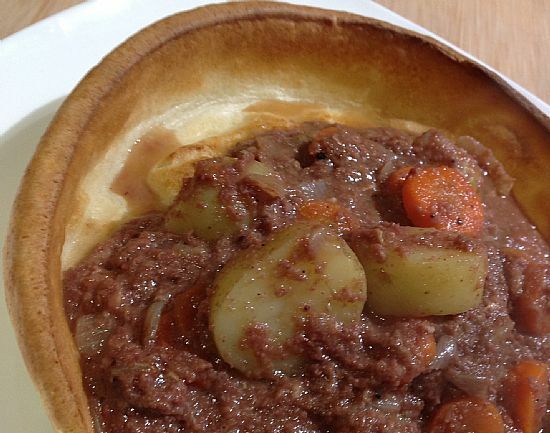 Simply fold giant yorkshire pudding in half and place in portion size container along with a serving of corned beef hash. 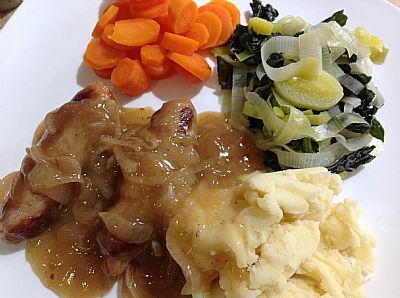 Storecupboard ingredients: the total cost of todays recipe includes basic storecupboard ingredients that can be used for other recipes which will save you money over time as well as build a good supply of essential storecupboard ingredients. Equipment: 1 small fry pan or wok, 1 x tablespoon, 1 x colander, 1 x knife, 1 x vegetable peeler, 2 x cake tins, 1 x pastry brush, chopping board, large saucepan, plastic jug, weighing scales or try calculating from weights/measurements on packets. Wooden spatula, serving ladel. Corned beef hash Ingredients: 2 small brown onions, 1 x tin of corned beef, 2 x beef stock cubes, 1 pint of boiled kettle water, 3 x medium sized carrots, 400g of baby potatatoes or 4 handfuls, 1 x tablespoon of brown sauce, 1 x tablespoon of sunflower oil. Method: peel and chop onions into small chunks. Add 1 x tablespoon of sunflower oil into a small fry pan or wok. Add diced onions and gently fry on low heat until golden brown. Remove the onions from the heat once browned. Peel and dice carrots into thin slices, place in a glass basin filled with water and heat in microwave for around 8 minutes or until soft to touch. remove carrots from the microwave and drain using a colander. Add carrots to the saucepan of cooked onions. Dice the baby potatoes into small chunks, place in a colander and rinse under cold water. Place in a glass bowl of cold water and heat in the microwave for around 10 minutes or until soft to touch. 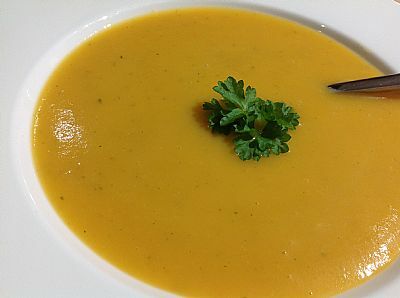 Remove from microwave, drain using a colander and add to onions and carrots. Remove corned beef from tin and chop into small chunks. Add to onions, carrots and potatoes and gently stir. Add 1 x beef stock cube. Mix 1 x beef stock cube with 1 pint of boiled water and stir together before additng to the saucepan of ingredients. Stir gently and bring all ingredients to the boil for around 10/15 minutes to reduce stock and allow to thicken. Continue to stir occassionally whilst ingredients thickens to prevent sticking to bottom of saucepan. Reduce heat once this has thickened. Once the recipe has thickened it can either be placed to one side or contuinue to cook on low heat stirring occassionally to prevent sticking to pan. 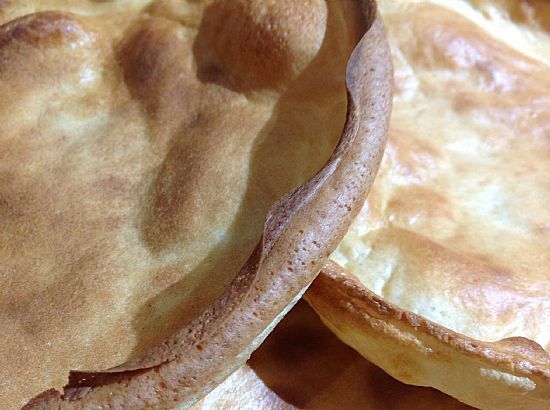 Yorkshire pudding ingredients: 4 oz plain flour, 1/4 pint of milk, 1/4 pint of cold water, pinch of salt, 2 x eggs, 1 x tablespoon of oil to brush oven trays. Method: Heat the oven to 225 or gas mark 7. Whisk 2 x eggs, 1/4 cold water, 1/4 cold milk in a plastic jug. Measure 4 oz plain flour into a mixing bowl and add a pinch of salt. Add the egg/water/milk mixture and whisk together until mixture becomes bubbly/frothy. Place to one side. Brush 2 x shallow cake tins with sunflower oil. Allow the oven to heat up before placing 2 x cake tins in the top half of the oven. Once the oven has heated, place cake tins in the top half of the oven and allow the oil to heat up for around 5 minutes. Remove both cake tins from the oven and pour a 1/4 of the mixture into each cake tin. Do this quickly but safely before placing both cake tins back into the top half of the oven. Heat for around 15 minutes or until both Yorkshire puddings have risen in size and are a yelow/golden colour. Remove from oven and repeat using the remaining mixture. Once cooked, fill each giant yorkshire pudding with a serving of corned beef hash (you may need to reheat if you have placed this to one side) You will have 1 extra so you can either freeze this or add jam filling as a delicious treat! Enjoy!